0806 13100 12/41 - To Washburn Wire 505 > VGN 6 > Eastern Gas & Fuel #? > GRHX #? 0920 69070 55/38 - To Tube City Iron & Metals #? The ALCO DL-109 units, built during World War II, were used for passenger service during the day, and freight at night. Their ALCO successors, the classy PA-1s, finished their years in freight service. The New Haven also extensively used Budd RDC-1, -2, and -3 Self-Propelled Rail Diesel Passenger Cars. 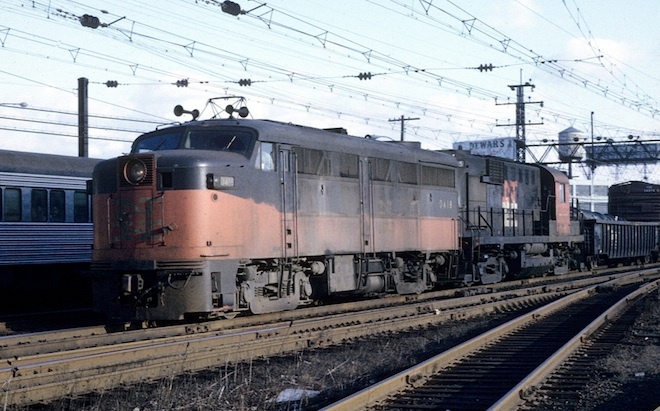 The New Haven never had any C-C Diesels, but were a prime user of A1A-A1A and B-A1A Passenger units, as shown above. Note that 590 - 599 and 1600 - 1614 were the same builder's model, but were classed separately.